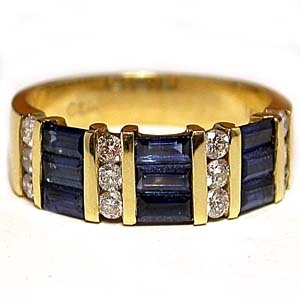 Round diamonds and baguette cut sapphires weave intrigue on this classically elegant ring in 18K yellow gold. Nine, baguette-cut sapphires and twelve, round diamonds are channel-set to glowing perfection on the contoured yellow gold band. Diamonds are F/G color, SI clarity, .48 ctw, sapphire gemstones are 1.80 ctw. The band is 6.5mm wide.